Chestnut Hill, Mass. (12/17/2018) – Researchers from Boston College and Brookhaven National Laboratory have succeeded in modifying a cuprate high-temperature superconductor material into an insulating state, where they found an exotic liquid crystal phase. The observation of a so-called “charge-stripe” crystal phase was the first of its kind in the cuprate, part of a class of materials referred to as Mott insulators, the team reports today in the journal Nature Materials. 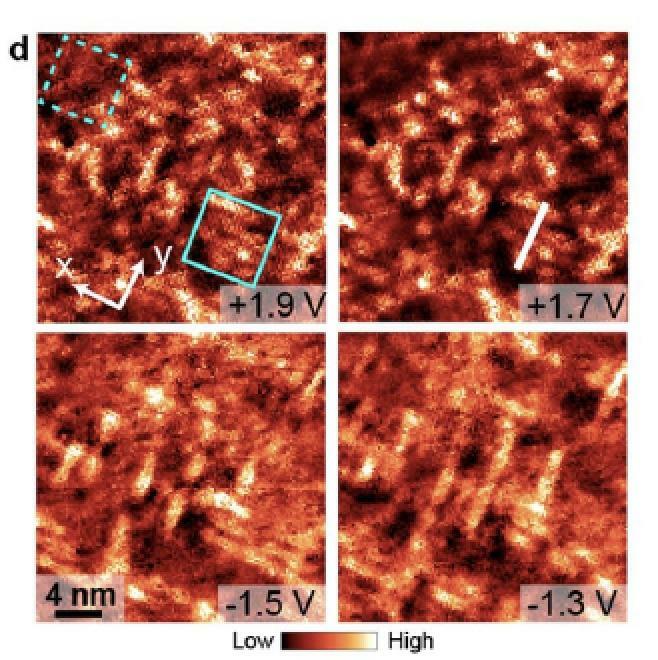 The absence of free charge carriers denotes the material as “undoped.” The process of doping introduces charge carriers and theorists have held that when doped, a cuprate would see the charge carriers order and form liquid crystal phases marked by periodic “charge-stripe” patterns. Such patterns have thus far only been experimentally observed in the superconducting state, said lead author Boston College Assistant Professor of Physics Iilja Zeljkovic. Accessing new regions of the material, the team achieved a “lightly doped, charge-transfer insulator state,” Zeljkovic said. The discovery raises the question of whether the “spin” of charge carriers also orders into periodic patterns, forming so-called spin-density waves, Zeljkovic said.